As it turns out, not very many – and for some unlucky bears in late summer, probably none. While they probably eat a bit better in late fall, if they’re lucky and persistent, by the time winter comes, biologists assume most bears again eat very little. This explains why all polar bears are at their lowest weight in late winter (March), just before Arctic seal pups are born. To put it another way, the reason that polar bears in some areas easily survive an onshore fast of 4 months or more over the late summer/early fall is that they would get very little to eat (if anything) even if they stayed out on the ice. It’s the fat put on in spring/early summer (from gorging on baby seals) that carries them over the summer, no matter where they spend it. Really? Take a look at the facts. 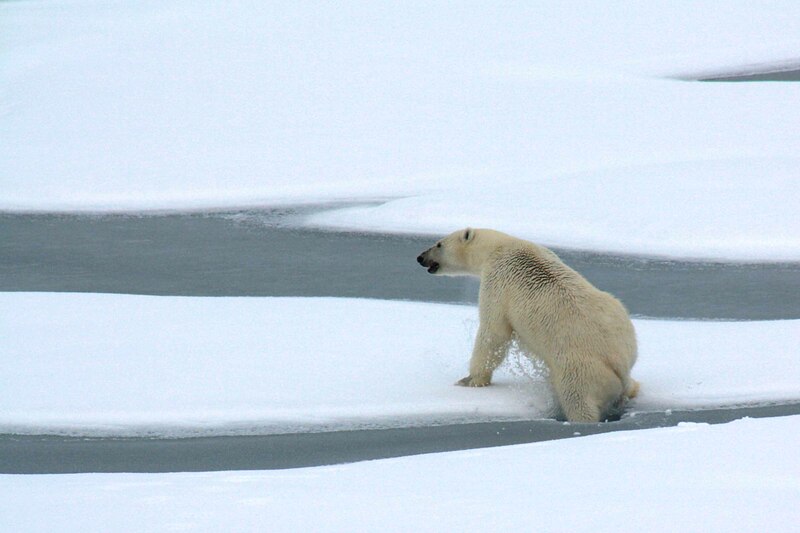 Ian Stirling (1974) reported his summer observations of polar bears from a high observation tower available on southern Devon Island (near Barrow Strait) in the central Canadian Arctic between 24 July and 8 August (Fig. 1). He noted that only five seals were caught during 602.7 hours of bear observations – and that was in 1973, before summer sea ice declines were an issue. Stirling attributed this “low success rate” to the fact that there are a large number of natural holes in the ice during the summer, which offers seals more escape routes. Stirling noted that the bears he observed spent about 30% of their time sleeping, 12% just lying around, 25% walking and 4% swimming (usually without any apparent purpose) – compared to spending just 2% of their time feeding. Ironically, that’s slightly less time feeding than Southern Hudson Bay polar bears spent during their time onshore during the summer! A study of James Bay bears in 1969 and 1970 found they spent 3.2% of their time feeding on geese and berries (Knudsen 1978). Figure 1. 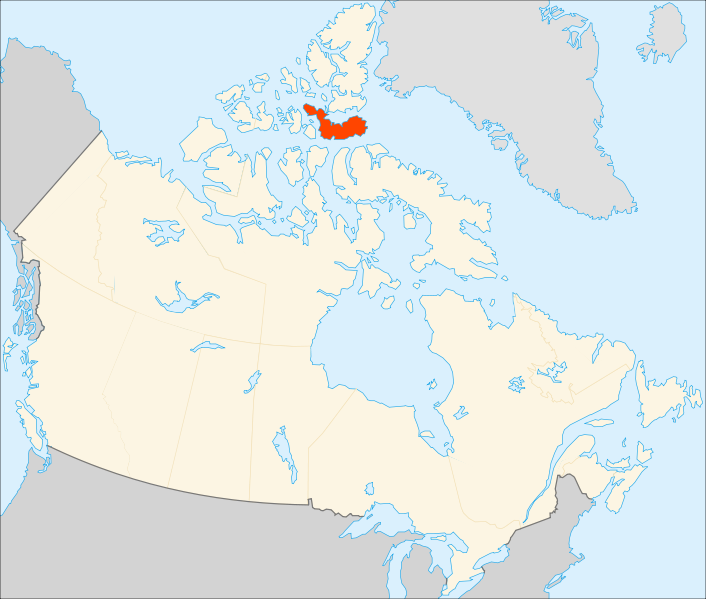 Devon Island in the central Canadian Arctic, adjacent to Barrow Strait, where Ian Stirling observed polar bears from a tower during the summer of 1973 (24 July to 8 August). 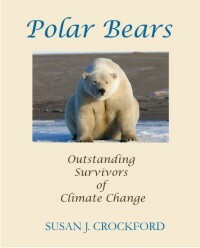 It is within the Lancaster Sound polar bear subpopulation. Wikipedia map. Figure 2. 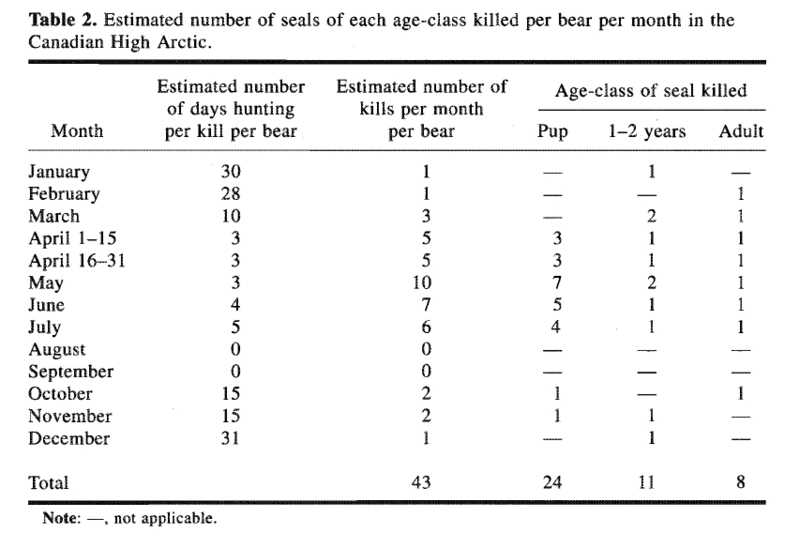 This is Table 2 from Stirling and Øritsland (1995), showing their estimation of the number of ringed seals killed by polar bears each month in the central Canadian Arctic in the 1970s. Numbers of seal kills for winter months are assumptions (no data available) and bears are assumed to spend the late summer months (August, September) onshore fasting, even though some bears spent that time on the pack ice (as did the bears in Stirling’s 1973 study). Click to enlarge. Another study provided no information on rates of polar bear feeding episodes but did report month-by-month evidence of seal kills found on the ice between 1984 and 2001 in the Svalbard/Barents Sea area (March to October). Derocher and colleagues (2002:449) recorded only 24 seal kills (various species, including ringed, bearded and harp seals) in August (the only summer month reported), less than half of the 58 kills recorded in April (highest kills for a spring month); only one kill was recorded in October. So, while it is clear that some bears were eating over the summer in the Barents Sea, we don’t have any idea how many bears were responsible for the seal kills found on the ice. Finally, confirmation that this pattern of limited hunting success from summer through winter is considered typical of all polar bear populations comes from a just-released paper on polar bear feeding by Nicholas Pilfold and colleagues Andrew Derocher, Ian Stirling and Evan Richardson (Pilfold et al. 2015 in press). Two-thirds of a year’s food supply consumed over three months (April – June) is the same as eight twelfths (2/3 = 8/12). That means 4 months worth of food is generally consumed over the remaining 9 months of the year. That’s not very much per month, spread over summer, fall and winter — especially since most of it is consumed during late fall2. Some polar bear biologists, and others, continue to claim that future declines in summer sea ice coverage are a serious threat to polar bear survival because it reduces their access to their prey (e.g., Stirling and Derocher 2012). However, observations made well before summer ice declines became dramatic3, polar bears were rarely successful at seal hunting in summer because it was so much easier for seals to escape. This means that even under the best of conditions, bears spending summers on the sea ice do not eat very often and some probably don’t eat at all. Even for bears that achieve a limited degree of hunting success, this reduced summer feeding probably approaches a “semi-fasting” situation, while unsuccessful hunters may fast as completely as bears spending summers onshore. This underscores the importance of the spring and early summer feeding period for all bears and shows how misleading it is to focus on recent declines — and potential future declines — of sea ice coverage at the end of summer (September). Footnote 1: Keep in mind that young bears that haven’t mastered the tricks of successful hunting will always be at risk of starvation, as they have always been – if they can’t put on enough weight in spring, they won’t last through the following summer, fall and winter of low feeding opportunities. 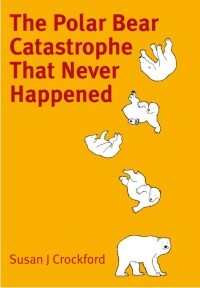 Steven Amstrup (2003) pointed out that starvation is probably the leading cause of death for young and old bears alike. Footnote 2: This statement by Pilfold and colleagues suggests that the conclusion drawn by Durner and Amstrup in (1996), regarding weights of Southern Beaufort Sea bears in Alaska (1983-1994), was misleading and/or mistaken. Durner and Amstrup stated that “bears of similar length were consistently heavier in autumn than in spring” (although they didn’t actually say by how much – it could have been only a kg or two). Their result was derived from a model designed to estimate body weights from girth measurements and body length, not a conclusion based on comparing weights over time of individual bears. Durner and Amstrup interpreted this result to mean that individual Beaufort Sea bears were lighter in spring than they were in autumn (when captured in October or November) – in contrast to all other populations studied (see also Amstrup 2003, quoted in footnote 1). While that could be interpreted to mean that Beaufort Sea bears continue to feed reasonably often over the summer, it is perhaps more plausible to suggest that they are more successful than average at hunting in the early fall — and thus regain lost summer weight more quickly. Footnote 3: Sea ice changes since 1979 shown below, from NOAA’s “2014 Arctic Report Card,” in the sea ice chapter. Summer sea ice (September minimum, red) has declined dramatically since 1979 but spring ice (March maximum, black) has declined only slightly. Durner, G.M. and Amstrup, S.C. 1996. Mass and body-dimension relationships of polar bears in northern Alaska. Wildlife Society Bulletin 24(3):480-484. During the summers of 1969 and 1970 polar bears (Ursus maritimus) were observed on North Twin Island (53°20′ N; 80°00′ W), James Bay. Almost all of their time (86.8%) was spent resting. They spent only 3.2% of their time feeding, primarily on geese (Branta canadensis) and crowberries (Empetrum nigrum). There was no difference between the time budgets of lone bears and females accompanied by cubs. 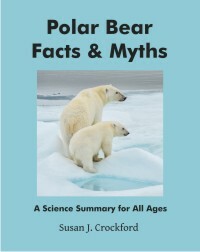 This entry was posted in Conservation Status, Life History, Sea ice habitat and tagged Arctic, Beaufort, Central Canadian Arctic, declining sea ice, fall, feeding, feeding platform, gorging, hunting, hyperphagia, Pilfold, polar bear, seal kills, seal pups, seasons, spring, Stirling, summer, terrestrial foods, winter. Bookmark the permalink.